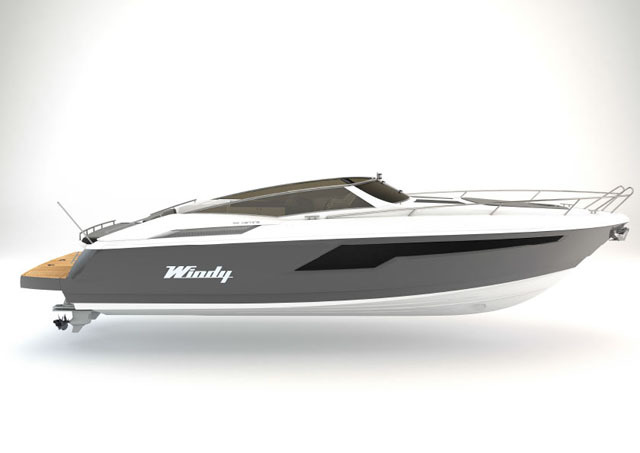 A new sports boat from Windy, known as the 29 Coho, is set to make its world debut at the Düsseldorf Boat Show from 19 to 27 January 2013. Designed to reaffirm Windy’s traditional values, the new 29 features a pared back profile, an acute deep-V hull from Hans-Jørgen Johnsen and a top speed in excess of 45 knots. Replacing the popular and long-serving 28 Ghibli, the new 29 also features an extended hull, a lengthened bathing platform and a new cockpit layout that aims to emphasise the pleasures of outdoor living. Distinctive rhomboid windows in the topsides are designed to channel plenty of natural light down below, where the upgraded accommodation centres on a large, luxuriously finished double berth forward, with a practical head and shower compartment, and a galley area by the companionway. Like many of its stablemates, this new Windy model is named after a wind - in this case, the cold airstream that blasts down the Columbia River valley in Oregon, which is in turn named after the legendary silver-sided Pacific salmon. The Coho is available with single or twin and petrol or diesel sterndrive installations. You can see more of the new Windy 29 on stand 5E20 at the Düsseldorf Boat Show or at www.windy.no.